If you enjoy seeing splendid pictures of butterflies take some time to go through our butterfly picture galleries. We have categorized these butterfly photos by specific type of butterfly for your convenience. This black and orange beauty appears strikingly similar to the monarch. However, there are differences in wing markings and general size that give this species away. Click here to see Viceroy butterflies. Another orange, black, and white butterfly, but completely different wing markings than monarchs or viceroys. Click here to see Painted Lady butterflies. The other monarch gallery on this site is made up of my own personal pictures. This gallery consists of the best photos across the world wide web. Click here to see Monarch butterflies. A Black Beauty with Yellow, Blue, and red highlights found throughout most of North America. Learn how to entice these beauties directly to your garden. Click here to see Black Swallowtail butterflies. This version of the swallowtail is predominantly yellow with black "tiger stripes" on its wings. There are a couple different variations of this butterfly depending on your location and they are difficult to distinguish. In the south, the female is often black, mimicking the markings of the poisonous Pipevine swallowtail. Click here to see Tiger Swallowtail butterflies. There are over 3500 different species of the skipper butterfly! Click here to see some of the most memorable. Click here to see Skipper butterflies. This butterfly is found throughout most of North America and is recognized by it's distinguished wing eyespots. Click here to see Buckeye butterflies. This small blue butterfly is found mainly in the northeast united states and has been frequently seen clubbing with Snooky and The Situation. Click here to see Karner butterflies. Brilliant blue butterflies native to South and Central America. They have a wide wing span of 6 inches. They also like to get drunk...I'm not kidding. Click here to see Blue Morpho butterflies. Named for it's similar markings to the favorite referee striped african horse. Click here to see Zebra butterflies. An Indian butterfly with eerily similar markings to that of the monarch. Can you tell the difference from the wing markings? Click here to see Tiger butterflies. Here are some pictures of different types of butterflies they may not be as widely known. 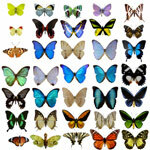 It is our goal to show you as many different kinds of butterflies as possible! Click here to see other types of butterflies. This page will be continuously updated as we find (and hopefully take) new amazing pictures of butterflies.